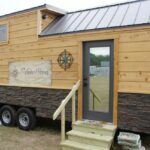 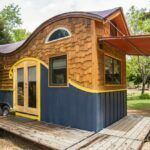 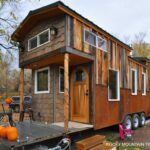 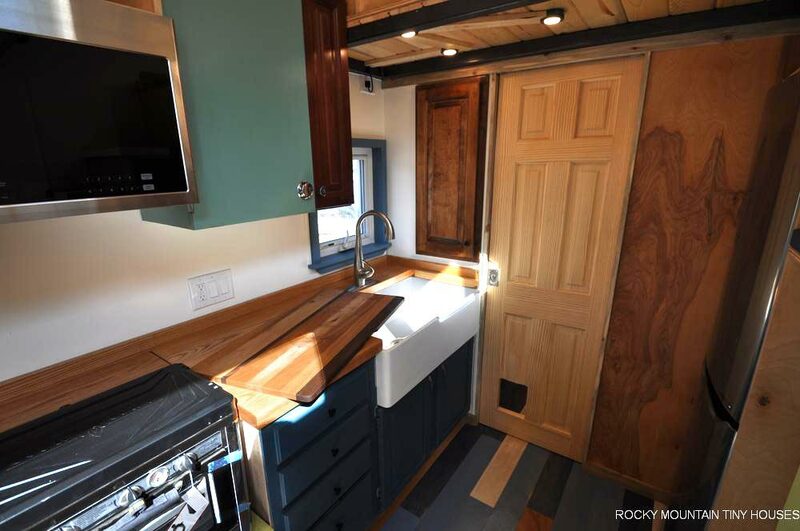 The Tandy is a 24-foot tiny house built by Rocky Mountain Tiny Houses. 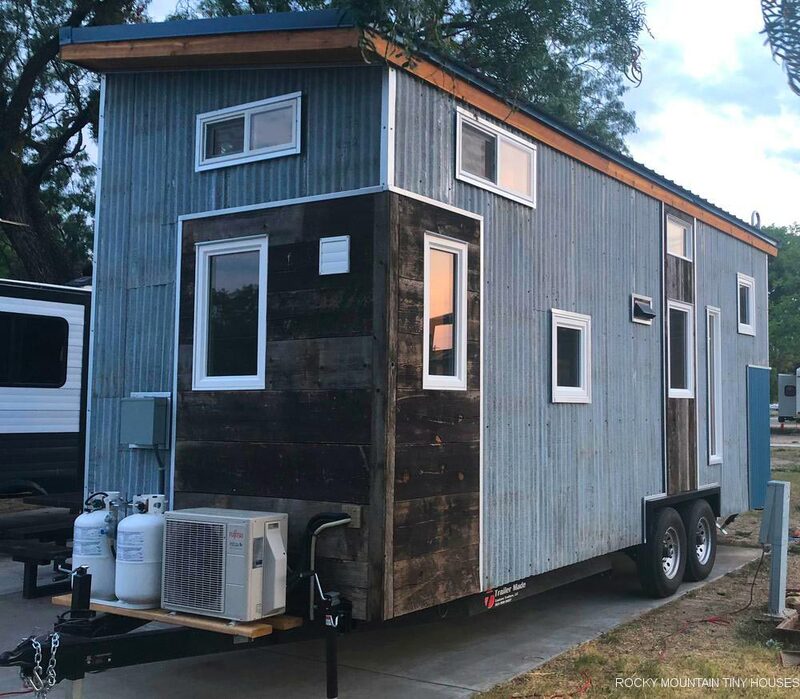 The home was custom built for a young woman in the Air Force. 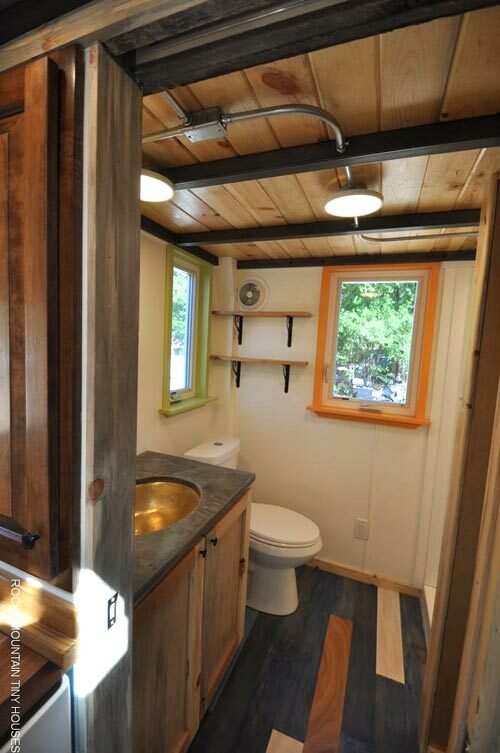 The owner wanted to save on cost and reduce her carbon footprint, so she opted to use a variety of reclaimed materials. 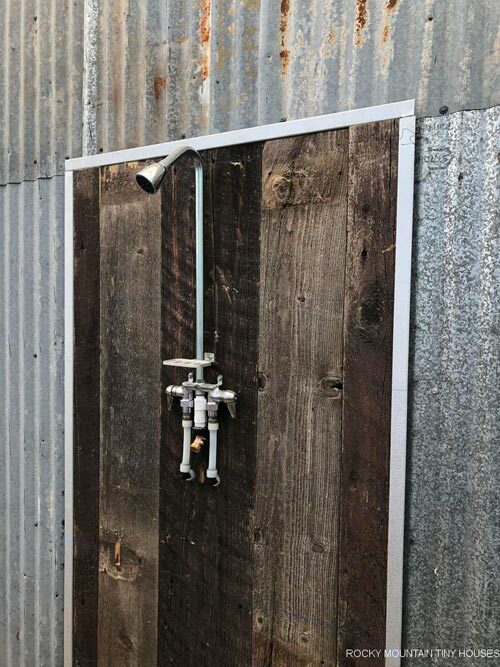 The exterior is primarily reclaimed corrugated metal and barnwood, and the oak oval door was purchased at a local salvage yard. 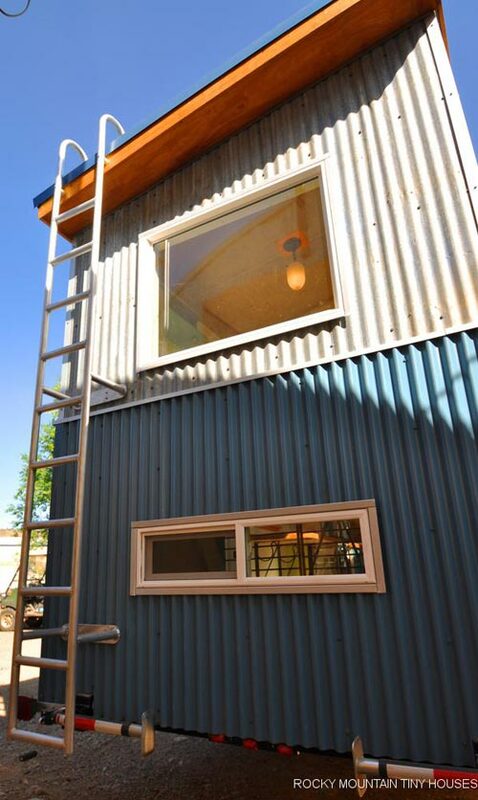 There is also an outdoor shower and an aluminum ladder to access the roof. 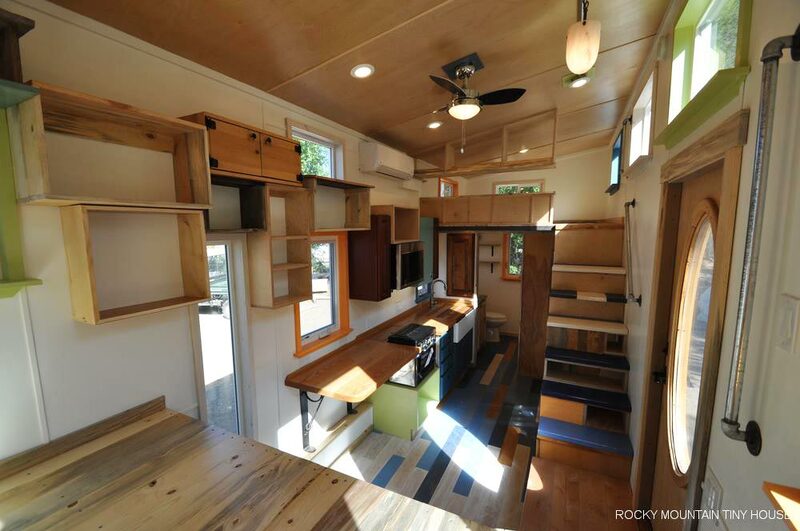 Inside the Tandy they used scraps of barnwood and plywood for the stairs, storage cubbies, and trim. 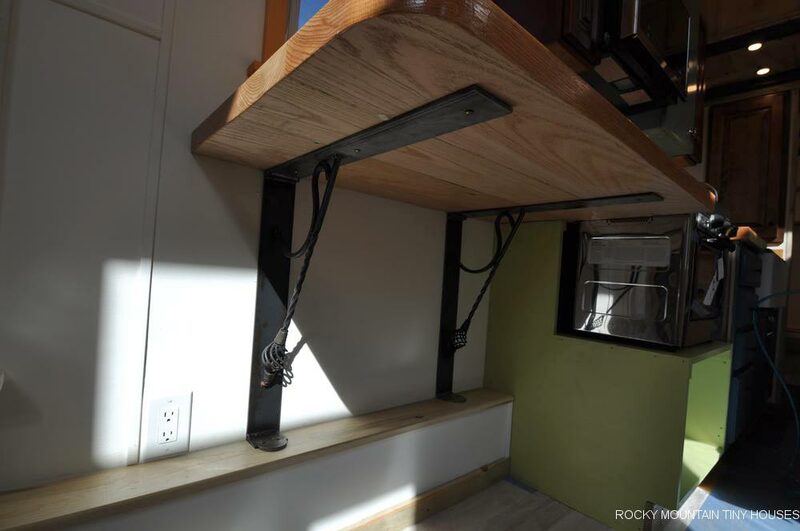 Wrought iron railings were repurposed as shelf brackets and there is a mix of reclaimed cabinets. 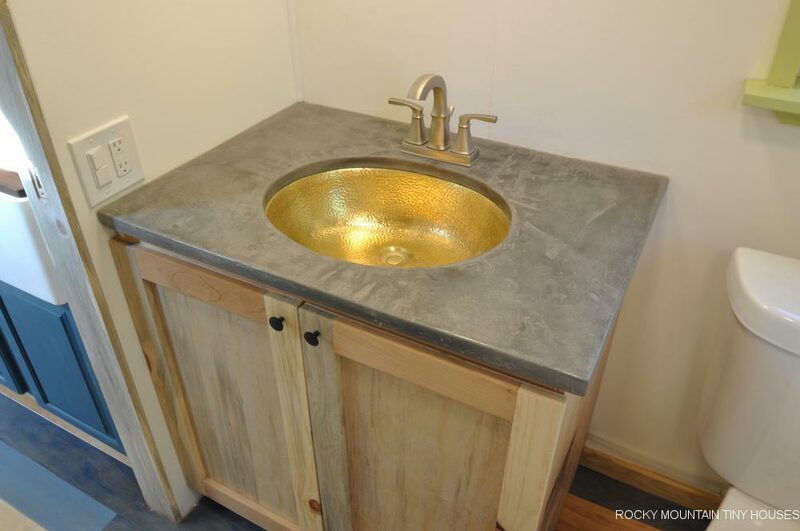 There’s even an antique Bates and Bates dimpled brass sink for the bathroom vanity. 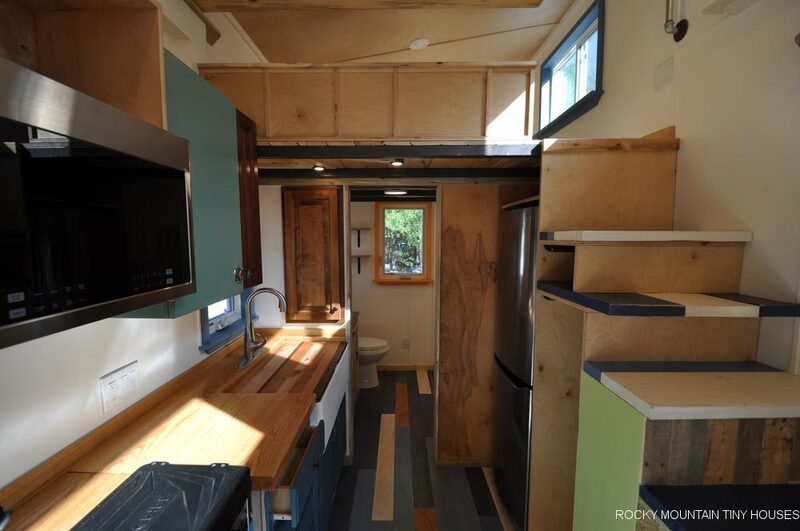 Along with the reclaimed materials are some new appliances and finishes including a microwave convection oven, farmhouse sink, LG 10 cu.ft. 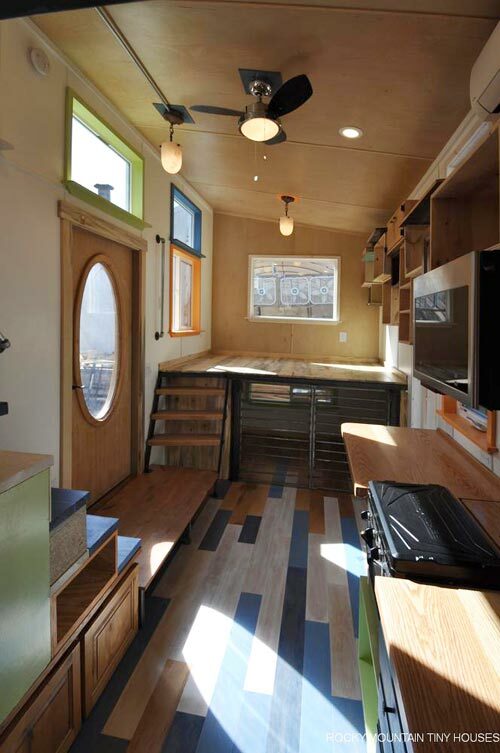 refrigerator, washer/dryer combo, and Fujistu mini split system. 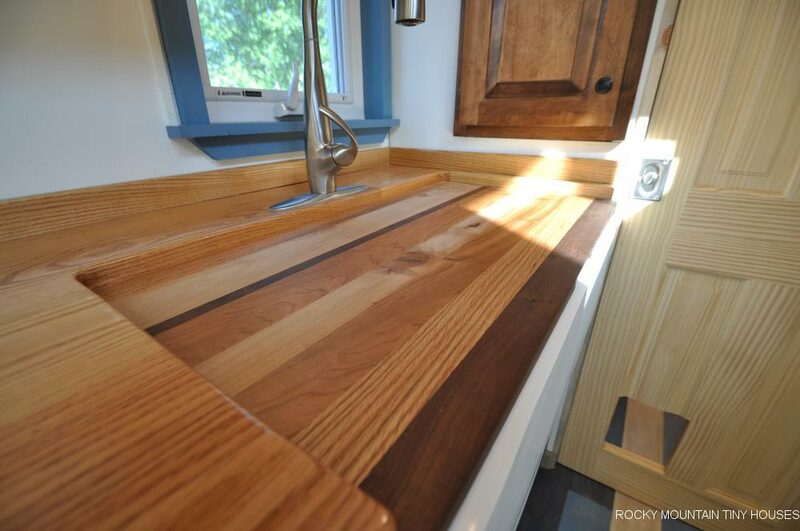 The kitchen counter is oak butcher block and the bathroom counter is concrete. 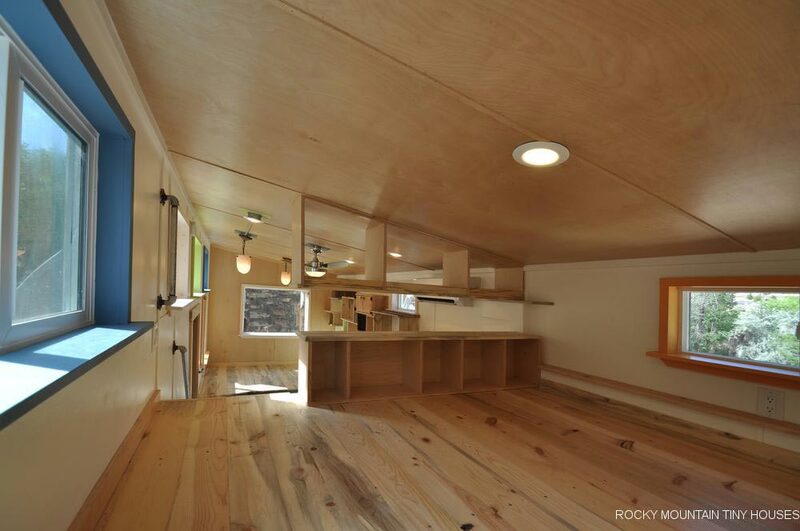 The owner has two dogs and a cat, so Rocky Mountain built an inverted loft with doggie den. 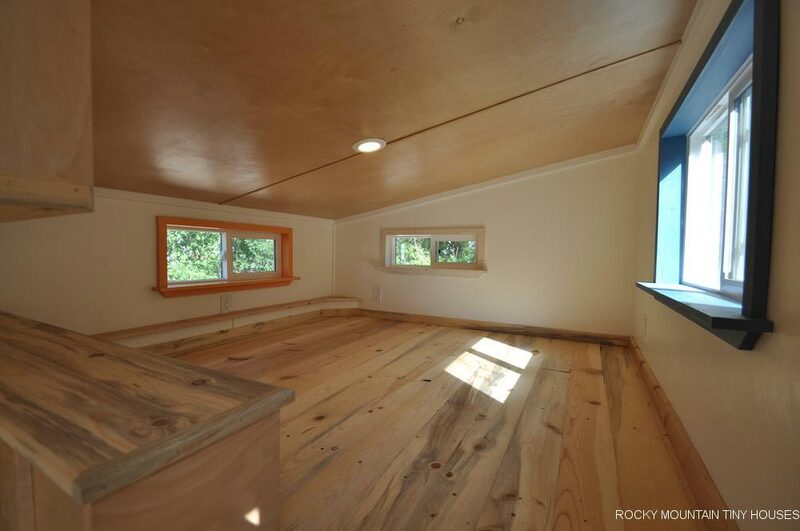 The doors can be kept shut while the owner is away and the den has a window at eye level for the dogs. 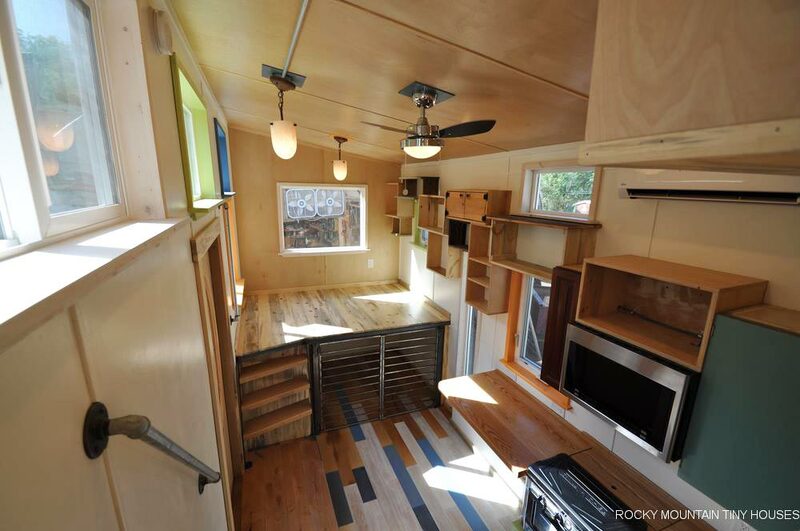 Above the den is a living room with space for a sleeper sofa. 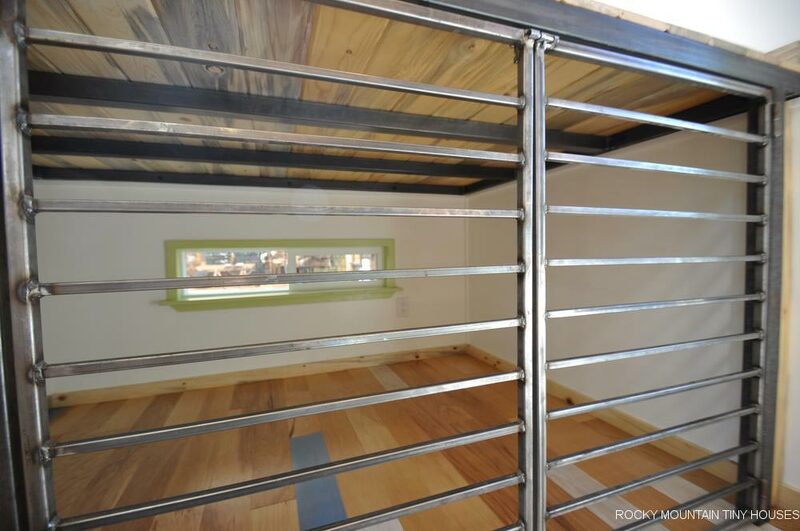 The master bedroom loft is accessed by storage stairs and includes built-in storage space that doubles as a privacy wall. 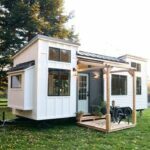 The Tandy was approximately $67,000. 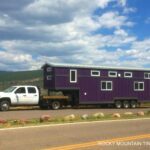 For more information about this tiny house, please contact Rocky Mountain Tiny Houses. 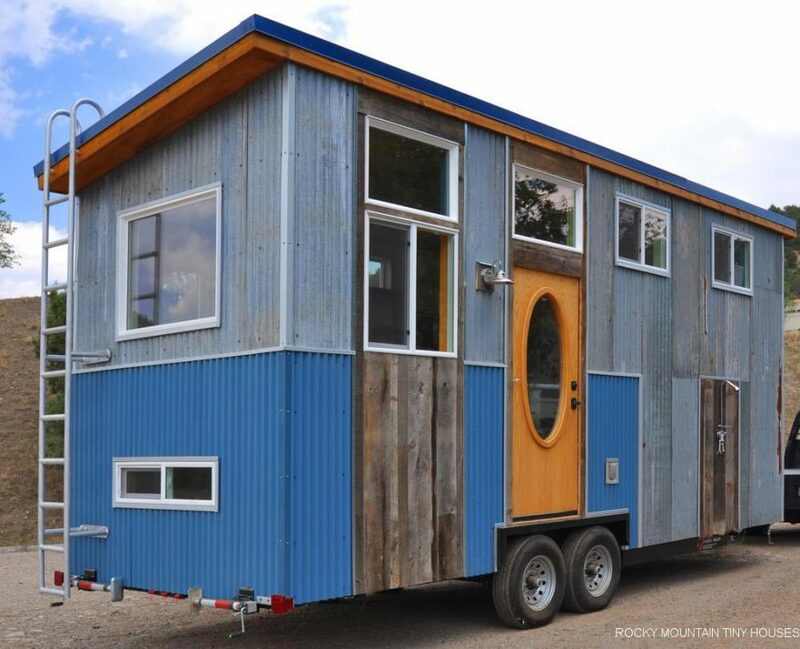 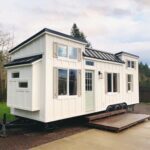 Also available from Rocky Mountain Tiny Houses: Infinitely Stoked, San Juan, Tandy, Wanderlust, Ad Astra, La Luna Llena, Pemberley, Pequod, Otsego Gooseneck, Red Mountain, Boulder, Harmony Haven, Ol’ Berthoud Blue.